I love books and I especially love a good reference book. I am not inclined to trust everything I read on the internet. I like to know that my information is tested. Even better if I know the authors of my books. Equine Herbal and Energetics sure fits my criteria as a source of information I can trust. Written by Stacey Small and Andrea Baldwin, this book not only contains amazing information about the physical properties of herbs but also their energetics. Energetics of an herb tells you how it will act in the body. Will it warm or cool, dry or moisten, energize or relax. Energetics are important but rarely included in most herbal descriptions. An example of the importance of energetics is garlic. Many references report the antibacterial properties of garlic but don’t talk about the heating effects of garlic. Garlic is marketed in nutritional supplements to repel flies but you don’t want to feed garlic in the hottest months of the summer because it can create excess heat. Energetics of herbs are also important when formulating supplements. Too many herbs with the same energetics can create an imbalance in the formula which could create an imbalance in the body if the formula is fed over a long period. Horses that have access to native pasture will pick and choose from multiple herbs to get just the balance they need. Equine Herbal and Energetics takes each herb and tells you everything you need to know about it. It lists the botanical name as well as the common name. It includes good pictures and descriptions. The book tells you where the herb grows naturally and how to harvest and prepare the proper parts of the plant. Information is given of the actions of the herb, the constituents, such as vitamin and mineral content, the folklore history, indications, dosages, contraindications, and toxicity ratings. The authors have also included use of the herb as a flower essence, aromatherapy oil or homeopathic remedy. If you feed herbs to your horse or think you would ever want to, then it is important for you to educate yourself on the subject. 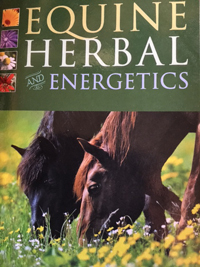 Equine Herbal and Energetics is a perfect book to have on your shelf. Last month’s newsletter included an article from guest contributor Nerida Richards, PhD that was originally published in the newsletter for Equi-Analytical Laboratories. Dr. Richards is the Managing Director and Principal Consultant of Equilize Horse Nutrition Pty Ltd, Tamworth, NSW, Australia, a company that specializes in providing independent, professional advice in all areas of equine nutrition. Within her role, Nerida provides high-level technical support to numerous national and international feed and supplement companies, as well as on the ground advice and technical support to breeding and training establishments. Nerida designed, developed and commercialised FeedXL, http://www.feedxl.com/, a ration evaluation program used by horse owners and industry professionals alike. As a Holistic Horsekeeping newsletter subscriber, you now have the opportunity to try out FeedXL for a month free of charge. We would love to have your input on your experiences with it to pass on to Nerida if you take advantage of this offer as they are looking for real users to give feedback for improving the system. Just email us at info@holistichorsekeeping.com with your feedback. To get your free month, go to http://my.feedxl.com/auth/newUser.fxl?ap=pro_1&t=M&country=us&coupon=EXCPHD and use the coupon code EXCPHD. This will give you access to creating planning for one horse for one month.